On Thursday, December 12, 2013 Professor was honored with the highest teaching honor of the College of Art and Letters. Watch the presentation in full. 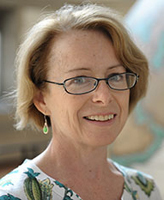 Julia Douthwaite, professor of French and Francophone studies in Notre Dame’s College of Arts and Letters, has been selected to receive the 2013 Sheedy Excellence in Teaching Award. “Douthwaite is one of the most influential and effective scholar-teachers to have graced our department since it was established,” says Theodore Cachey, Albert J. and Helen M. Ravarino Family Director of Dante and Italian Studies and immediate past chair of the Department of Romance Languages and Literatures. The highest teaching honor in the Arts and Letters, the Sheedy award was founded in 1970 in honor of Rev. Charles E. Sheedy, C.S.C., who served as dean of the College from 1951–69. The award ceremony will take place on December 12, 2013, at 3:30 p.m. in the Notre Dame Conference Center in McKenna Hall and is open to all faculty and students. Julia Douthwaite (far right) worked with students Lea Malewitz and Lauren Wester to bring the DIGNITY project to campus last year. The students and faculty who nominated Douthwaite commended her extraordinary dedication, creativity, and academic excellence, says JoAnn DellaNeva, associate dean for undergraduate studies and professor of French. The DIGNITY project, which honored the tricentennial of Swiss philosopher Jean-Jacques Rousseau’s birth, included a series of guest lectures and a powerful photography exhibit on poverty and human rights in conjunction with Amnesty International. Douthwaite collaborated with several of her students to bring the exhibit to the Snite Museum of Art. She credits them for helping make the project a reality and says she has learned from their ebullience. 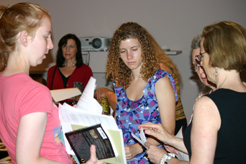 Julia Douthwaite offers students the opportunity to do an “altered book” project. Recently, for example, she began offering students the opportunity to do an “altered book” project in her classes. Douthwaite says the idea came out of a discussion with a fellow professor in the Department of Art, Art History, and Design on how to bring new creative techniques to the classroom. 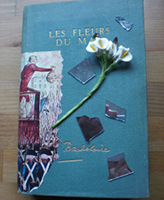 She and her students use a variety of methods to add their own text and images to the books, even partially burning pages or attaching such items as broken glass. The projects are a lot of work, but she says her students find the experience memorable and inspiring. Artistic endeavors like these, she adds, complement and enhance her own scholarly writing. Douthwaite focuses her research on the French Enlightenment, the Revolution, and French-English relations in the 18th and 19th centuries. She has received grants from the John Simon Guggenheim Memorial Foundation, the National Endowment for the Humanities, and the Lilly Foundation. She is author of The Wild Girl, Natural Man, and the Monster: Dangerous Experiments in the Age of Enlightenment and Exotic Women: Literary Heroines and Cultural Strategies in Ancien Régime France. 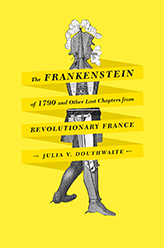 Her most recent book, The Frankenstein of 1790 and Other Lost Chapters from Revolutionary France (University of Chicago Press, 2012), shows how key events of the French Revolution took shape through newspaper reportage and imagery produced during the turmoil, and how those same events were later retold by authors such as L. Frank Baum, Mary Shelley, Honoré de Balzac, and Charles Dickens. During her time at Notre Dame, Douthwaite has served as associate dean in the College of Arts and Letters, director of Notre Dame’s study abroad program in Angers, France, and assistant provost for international studies. She is also an active volunteer in the local South Bend Community Schools and teaches in Notre Dame’s Upward Bound summer academy. Julia Douthwaite, winner of the 2013 Sheedy Excellence in Teaching Award. Douthwaite says her teaching style has evolved over the years, focusing less on giving students information and more on allowing them to discover key messages for themselves. Watching her students’ skills develop and seeing what they can accomplish is rewarding, she says. “It gives me hope for the future and excitement about working with these young people,” she says. “It’s neat to see the spark in their eyes.